To equip youth with marketable skills that can help them improve their livelihoods and build confidence for the future. 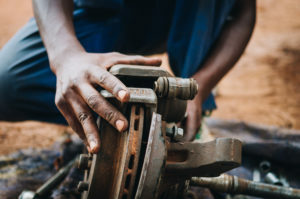 An automobile mechanics student practices his skills by repairing a brake system. Mwana Nshuti vocational training school started in 1998 in Kicukiro District, Kagarama Sector, Kigali. After the 1994 Genocide, many children were dispersed in different parts of the country. 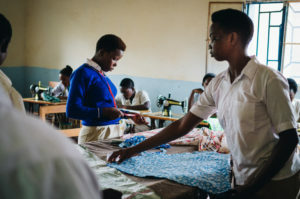 Because of the problems facing them, Mwana Nshuti started to welcome in a number of street children, giving them some food and education – especially in vocational skills such as sewing and painting. Some of them found jobs after Mwana Nshuti and Mwana Nshuti sponsored some students to complete their interrupted primary or secondary schooling. 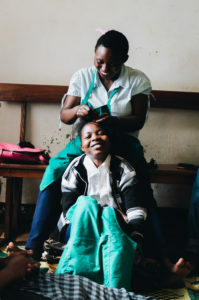 Mwana Nshuti has grown throughout the years and we want Mwana Nshuti to continue this growth and improvement in providing the opportunity for students to develop themselves through a variety of vocational skills. Mwana Nshuti has seen many changes in the past year. izimana, English Teacher at Kagarama Branch. In addition to their vocational skill classes, each class of students receives Entrepreneurship, Mathematics, English, and Swahili courses to enable them to further their economic success beyond basic employment. Students are encouraged to innovate and to think big when it comes to the possibilities awaiting them after graduation from Mwana Nshuti. Hairdressing students practice braiding with each other’s hair. Community among students and faculty is an important aspiration of our vocational school. The Kagarama Branch of Mwana Nshuti now has three vocational training options. Students can choose from Hairdressing, Culinary Arts or Motor Vehicle Mechanics to train for future employment with these skills. In 2018, we entered into the 10th promotion of Hairdressing, 5th promotion of Culinary Arts and the 5th, year-long promotion of Motor Vehicle Mechanics. Over the last several years, we have seen students go on to pursue jobs with established companies, start their own businesses or pursue higher education, encouraged by the confidence and love of learning they gained at Mwana Nshuti. Help vulnerable youth to create their own jobs. Train students to work together in association. Assist students to change their standard of living and the broader society they live within. In December 2013, the Sewing section of Mwana Nshuti Kagarama moved to Bugesera. There were fewer job opportunities for tailors in the city, but sewing remains a valuable skill in the countryside. 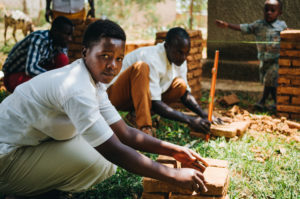 The Construction option was soon after established in 2016 to provide youth with skills to meet the demands of a growing population and increasing economic growth outside of the main city of Kigali. In 2018, we entered into the 9th promotion of Sewing and the 5th promotion of Construction. In these two promotion options at the Bugesera Branch, as of mid-2018, we had taught 241 students, 187 of whom have been young women. In the Sewing option, there are currently 20 sewing machines, but we hope to increase this to one machine per student. As in 2018 we entered into our 9th promotional period of Sewing, we continue to excitedly look towards the future development and seeing more students gain access to economic sufficiency through their training. Over the past several years we’ve had some exciting developments! Sewing associations have been successful in the community here. At the Centre of Nyabagendwa there are three ladies working together, at the Centre of Rihima four women work together in another association, and at the Centre of Kabagora a group of one gentleman and two women have joined together. Starting their own atelier with modern machines, a man and woman have even been employing sewing graduates at the Centre of Kabukuba! There is much to bring us joy as the work continues here in Bugesera. Mwana Nshuti is now well known in the districts around us, as a quality vocational training school. As our relationships and the alumni base continue to grow, we are finding it difficult to keep up with the wedding invitations from former students! The news of their weddings and the encouragement of their ability to develop themselves and improve their standards of living has given us hope that the work of Mwana Nshuti is making a real impact in the lives we touch.